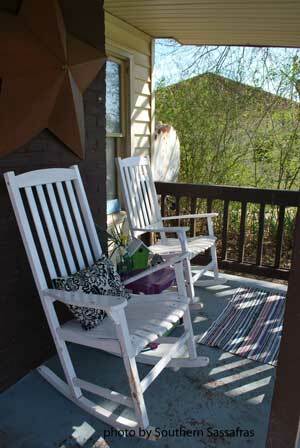 When spring rolls around it's a great time to update your porch look! Our Quick Spring Decorating Ideas Guide will get you motivated and excited to welcome spring onto your porch and into your home! Nothing says spring quite like its natural beauty and landscaping can make for some very curb appealing spring decorating ideas. 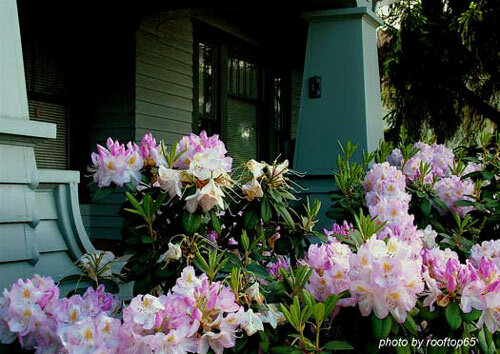 From daffodils to flowering trees, use landscaping to embrace your front porch and home. Don't forget to use our Spring Porch Decorations Directory at the end of this section to find even more ideas! Forsythias on the Spring Porch! It's our favorite idea for spring so far and was super easy to pull together. Grab your paint brushes and some yellow paint and let's get started. A spring decorating idea we think you'll like! Our neighbor Sandy is an avid gardener. 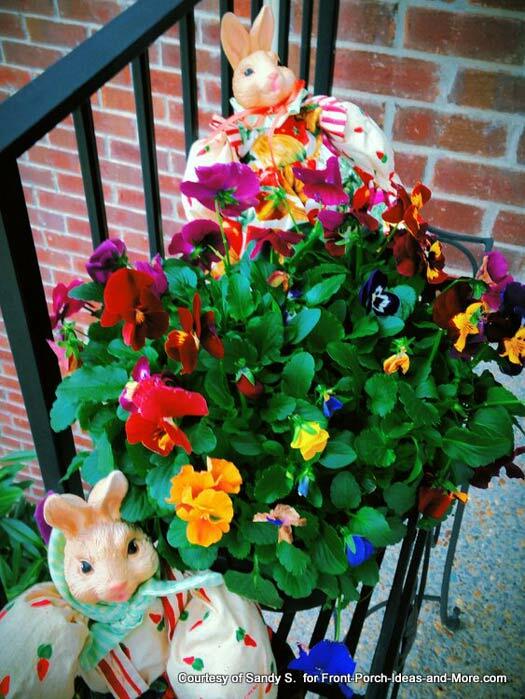 Look how cute these pansies and bunnies are on her front porch. 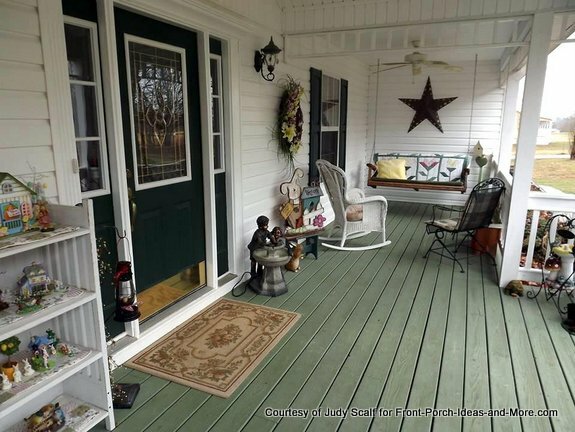 We are most appreciative that Judy shared her country porch with us. It's all freshened up and decorated for springtime. 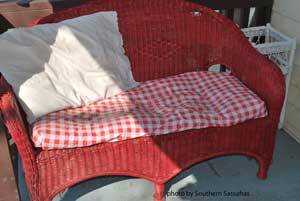 She made the pillow and the quilt on the porch swing. Such a talented person! 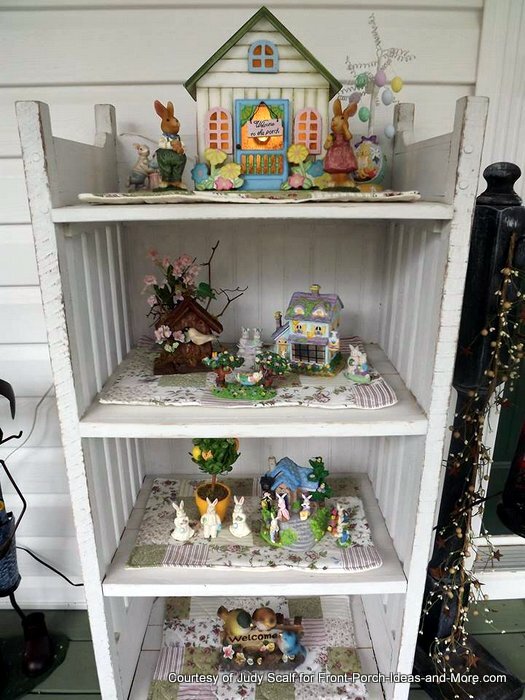 Judy's husband built this cabinet for her seasonal porch decorations. We like the cute bunnies and birds. 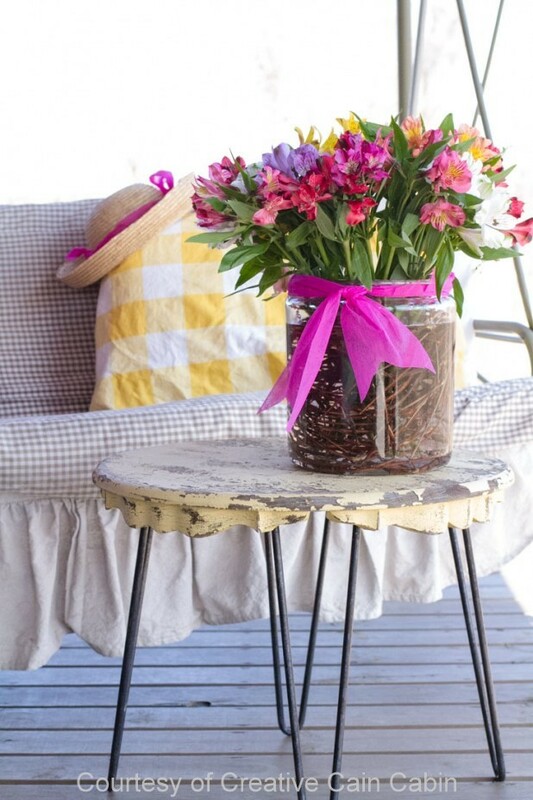 Sweet spring decorating ideas! With a grapevine wreath, a cheesecloth bow and a few simple flowers - voila! Our friend, Jennifer, makes decorating look so simple. This video is no exception - such a beautiful spring decorating idea. 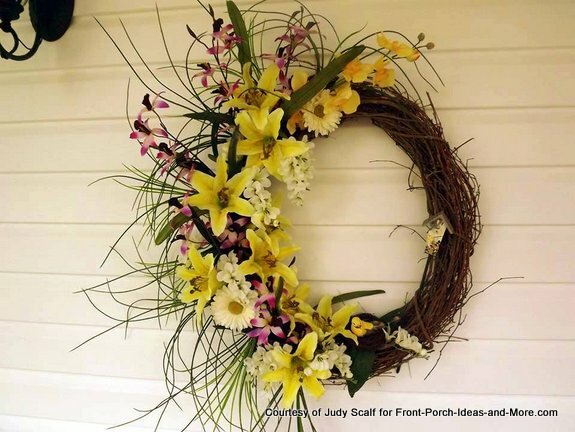 Without the eggs, this wreath could be displayed all spring. Talking about spring porch envy! 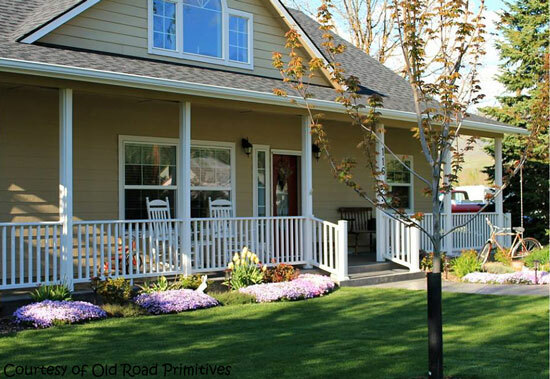 Kim, from Old Road Primitives, has the epitome of a wonderful old-fashioned porch and gorgeous front yard landscaping. See her Christmas porch here. Do you see the daffodils out the window? Yup, spring is about here. Adorable springtime porch! Photo is courtesy of kbo, author of Cute Cottage Overload. I love how Dawn decorates. It's all country-like, fresh gingham-y and colorful. Makes you feel right at home. Dawn is the author at Creative Cain Cabin. 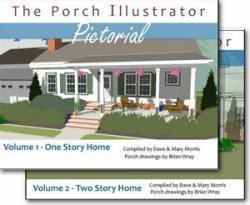 We got to interview Dawn so go here to see what she has to say about porch decorating and see her rustic autumn porch featured, too. You don't want to miss it. Our Colorful Springtime Porch - Pansies! We hope our spring porch inspires you to put out a few bright and cheerful spring pillows and enjoy your porch every chance you get. 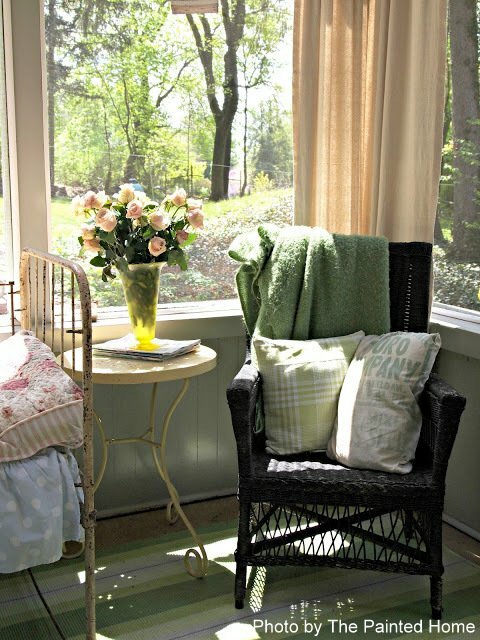 Denise, of The Painted Home, has a wonderful screened porch that is ready for springtime. 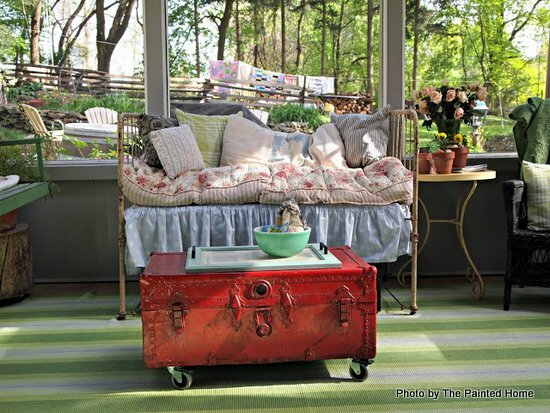 She's an interior designer with a true knack for color and design, so grab some spring decorating ideas for your porch. Do you see the quilts hanging on the clothesline outside? Just our kind of place! And the day bed heaped with lots of soft pillows? Oh my. 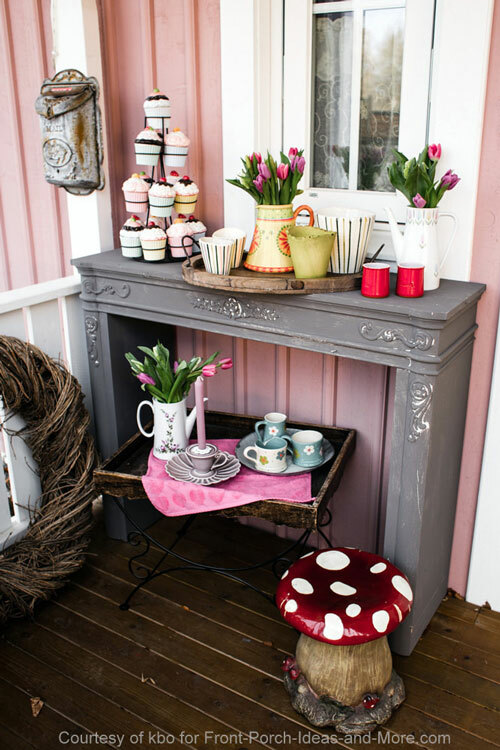 I like how Denise fashioned this old vintage trunk as a table for her porch. Easily moves around with the casters. Very chic! Love this view from above. The greens and blues are very calming and we like how the colors in the room are reflected in the striped rug. The day bed looks like a very soft place to land. Makes me think of a sleeping porch! We would sure love spending an afternoon at Denise's porch. What a relaxing, serene place to be. Here's a comfortable looking wicker chair in the corner of Denise's screened porch. I like the porch curtains behind the chair - adds a soft touch of privacy. And the flowers on the side table are the best. 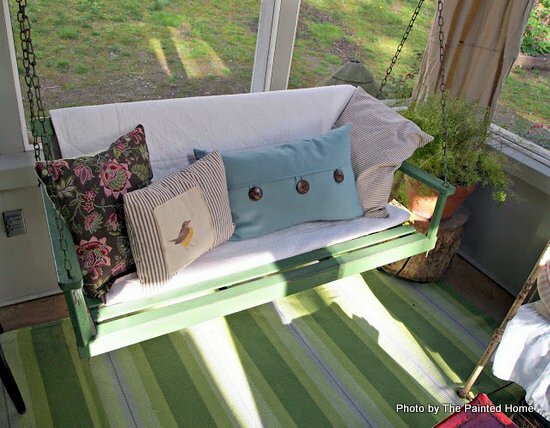 And lastly, wanted to share Denise's porch swing with you. Oh my goodness. How inviting this is - painted a beautiful shade of green and made soft with bunches of cute pillows. Denise is the author of The Painted Home, a blog all about making a warm, beautiful home without breaking the bank. Denise is an Interior Designer based in Philadelphia. She has an eye for color (indeed!) and likes to turn flea-market finds into something special for your home. Our thanks to Denise for sharing her spring decorating ideas with us. Placing colorful spring arrangements on your porch or on porch steps to create welcoming curb appeal. Here's a few spring foliage pictures to give you ideas. Select and plant your spring bulbs in the fall to have a most colorful spring. Color it up: No really good spring decorating idea guide would leave this out. 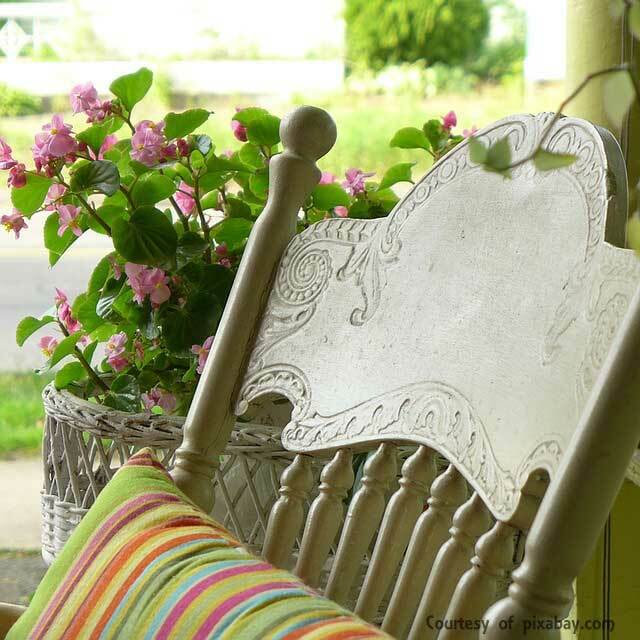 Add floral and paler tones to your porch. 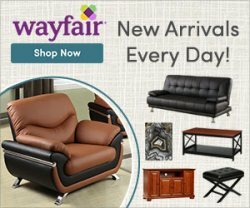 Make or purchase cushions and covers with floral colors. Use our handy color charts to find just the right color scheme. Hang planters: If the threat of frost is gone start putting out plants, hanging planters, and box arrangements on your porch. 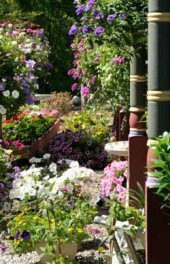 Depending on your geographic area select plants that have the most color and complement your porch colors. Plant an herb garden or some pansies in planters. Find a sunny spot - even if that means putting the pots on your steps, provided there's enough room. Nothing more welcoming than a beautiful flowering plant. 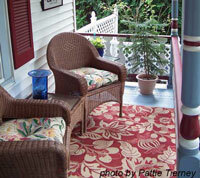 A new outdoor rug Ever consider an outdoor rug for your porch? Arrange your furniture for conversation and use an outdoor rug to pull it all together. Take care in choosing just the right color or color combination. 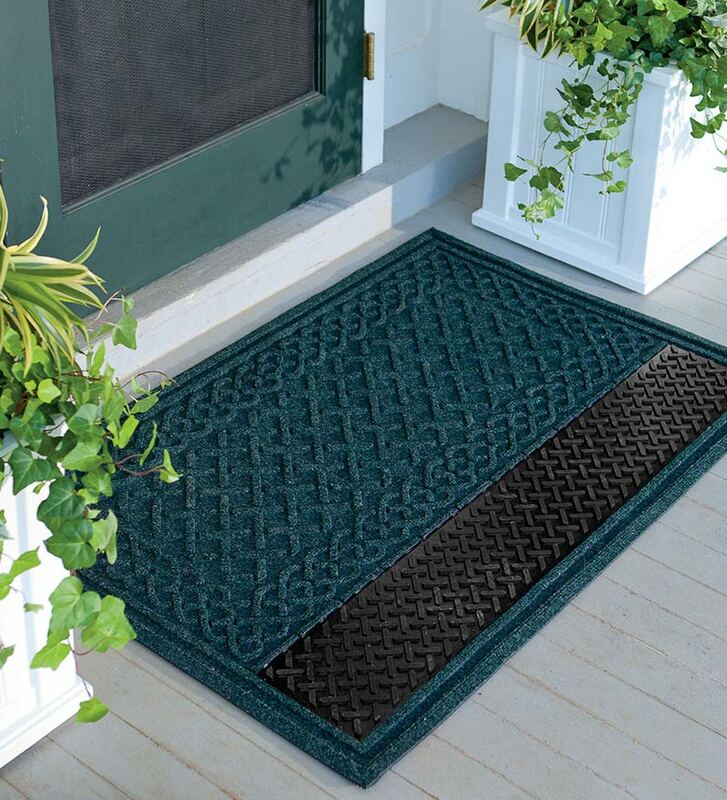 Replace your doormat Your friends and family will notice the fresh look of a snappy looking mat. Whether adding some spring delight to your porch or wanting a gift for someone for Easter, a birthday, or other occasion, see a fantastic selection of outdoor mats (like the one at right) and outdoor rug ideas too at Plow and Hearth . Decorate your front door: Decorate your front door with a decorative front door wreath like the one in the photo below. Make it colorful, fun, or both! 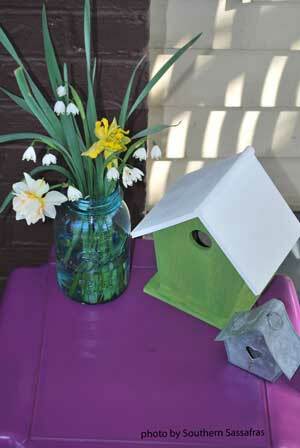 Create a quick focal point by putting a few bird houses close together. Add a bird bath and you'll enjoy hours of serenity watching our feathered friends. They are inexpensive to purchase or better yet, easy to build. Don't have a tree nearby? Just hang them from a wrought-iron plant hangar. Or, start a flower garden just off your porch and add plants that attract butterflies. 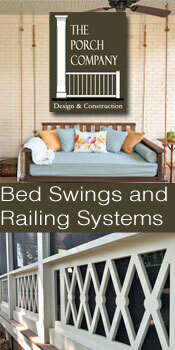 Review our porch landscaping section for some great ideas. 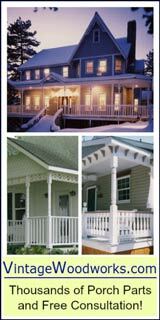 Create a focal point: An often overlooked decorating feature on porches is a "focal point". Find an item that can easily be a conversation piece or something that catches the eye (items of bright colors work well). It could be a piece of outdoor art, colorful cushions, or floral arrangements. 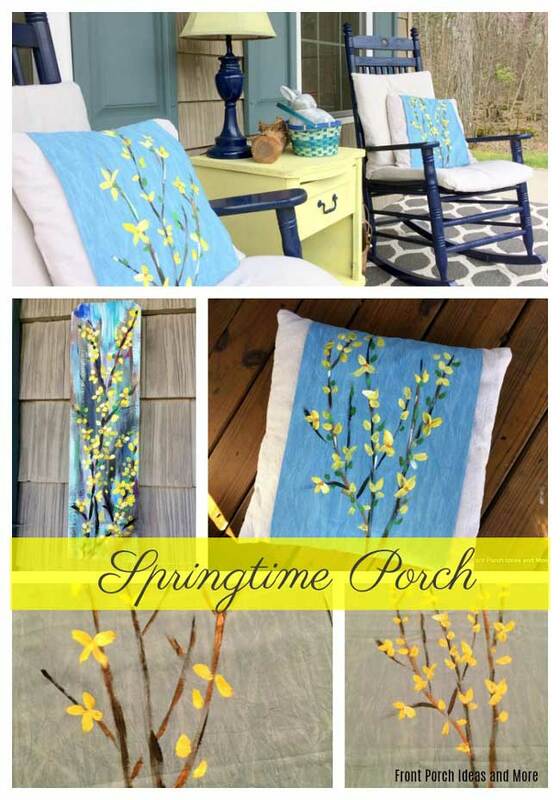 We like how Taryn, author of Taryn Whiteaker, dressed up her small front porch for spring. Your eyes are drawn to the cute chair and crates both with colorful potted plants. Taryn shows how simple decorations can reap huge rewards. 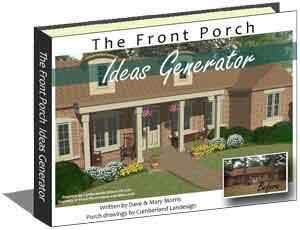 Dave and I love this most curb appealing porch for spring. Our thanks to Taryn of Designs, Dining, + Diapers Blog and encourage you to visit her often for more fun ideas. For more ideas for creating a focal point see our Guide to Decorating Ideas and Concepts. 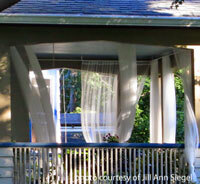 Sheers or outdoor curtains A neat spring decorating idea is to hang sheers or porch curtains from your porch. These can give you a sense of privacy and add color as well. You can tie them back or let them hang free. Move the snow shovels: Often times our porches become storage locations over the winter. Move out the snow shovels, ice melt containers, lost mittens, etc. 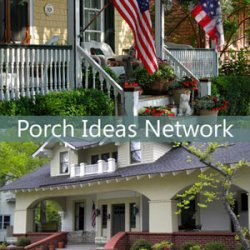 Make your porch inviting to others. Rake up, sweep: Rake up, sweep, and get your landscaping around your porch ready for planting. Now's a good time to assess your steps and walkways to see what maintenance they may need. The thawing ground will reveal walkway heaves that need to be attended to and landscaping lights that need to be fixed in place again. 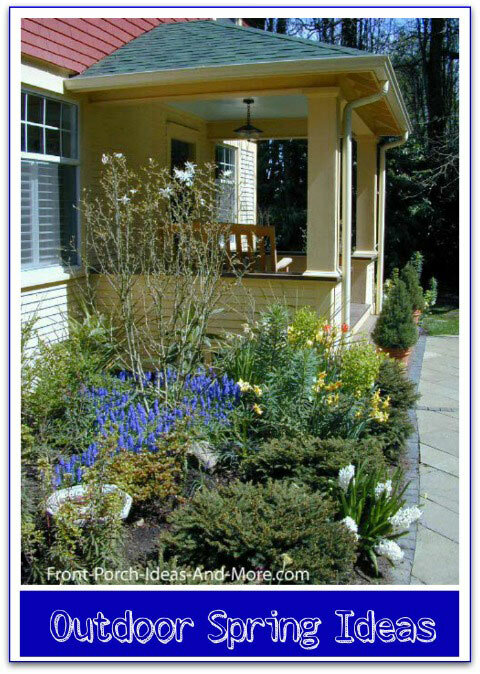 Use our porch landscaping ideas section to envision changes you'd like to make. 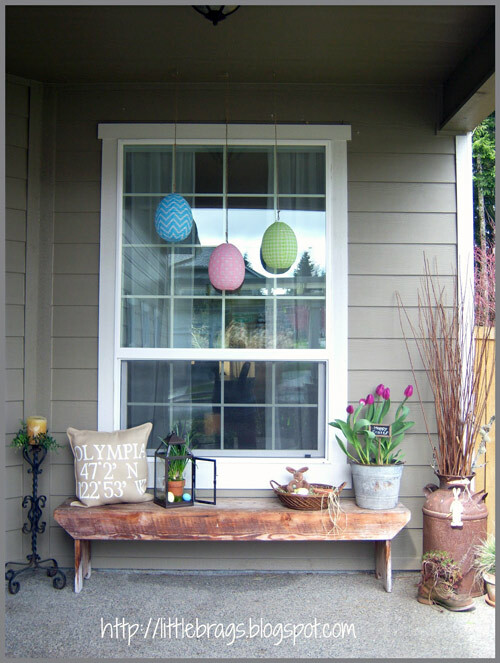 Christine, of Little Brags blog, was kind enough to share her spring-time decorated front porch. 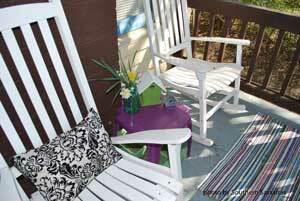 With just a few decorative items, Christine has transformed her porch into a charming and appealing array. The bunny is her son's pet rabbit. 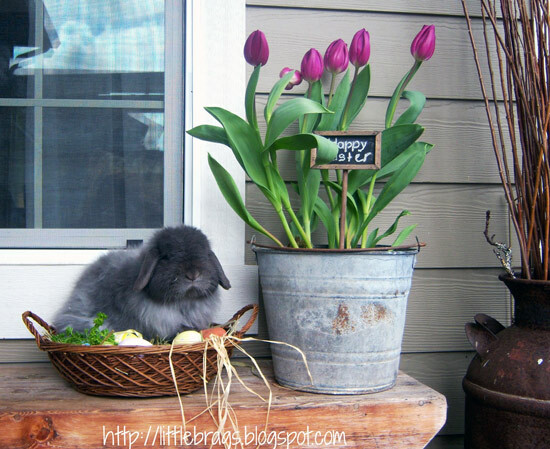 Not everyone can introduce a real bunny into their decor. The bunny seems to like being the center of attention - bunnies love spring! We appreciate Christine for allowing us to share her porch with you. Visit Christine's Little Brags blog for more decorating ideas. 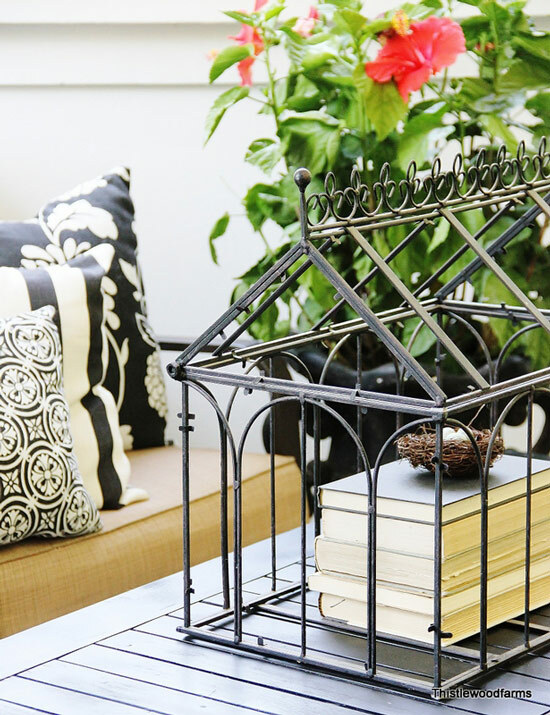 KariAnne of Thistlewood Farms blog adds an air of sophistication to her spring time screened in back porch. 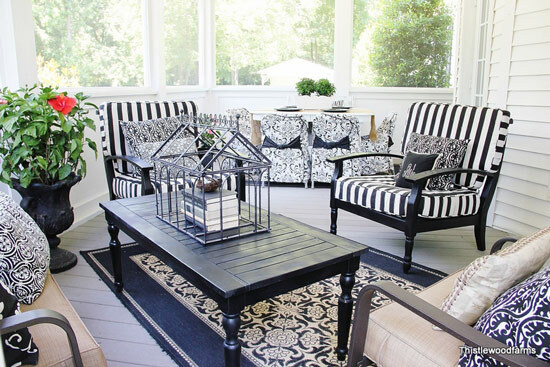 Elegant but comfortable, KariAnne's porch is ready for entertaining or just relaxing to enjoy a warm spring day. Our special thanks to KariAnne and encourage you to visit her blog at Thistlewood Farms where she shares spring decorating ideas and much more. 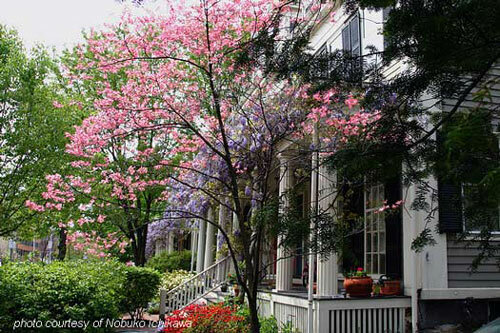 The flowering ornamental tree is beautiful against this front porch. 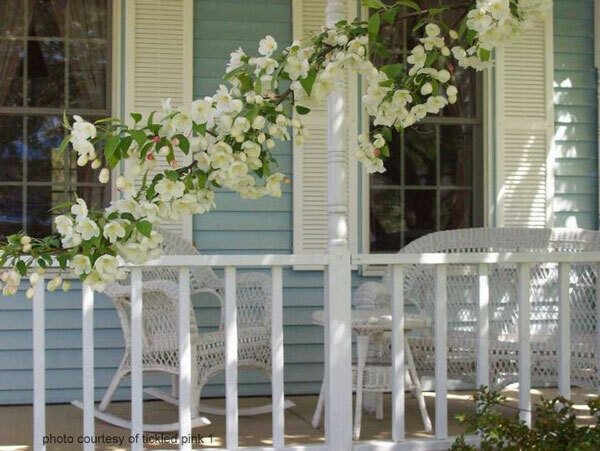 We are often asked about what spring decorating ideas we have for small front porches. Although restricted by size, small porches can really sizzle! A small porch has an advantage- it's size. You can create the "wow" factor through color and focal points. 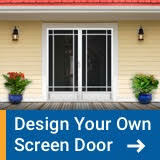 We offer lots of specific suggestions in our small front porch and landscaping sections. You can make a dramatic impression by choosing the right color and color combination, selecting an object that becomes a great conversation piece, and decorating the area adjacent to your porch. It doesn't always have place just shrubs on either side. 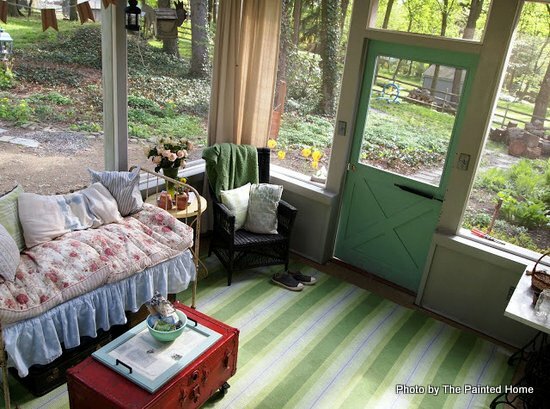 Lauren author of Southern Sassafras used color and just a few accents to liven up her small porch for spring. Like many people, Lauren rents her home so she is somewhat limited. But that didn't stop her! 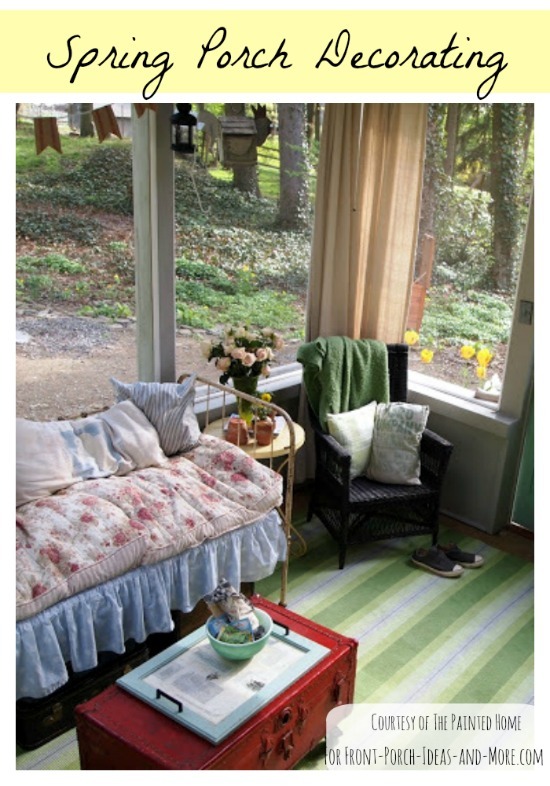 She washed the porch floor and rather than repainting, Lauren added a colorful rug. This is an easy way to upgrade any porch floor and it looks great! Lauren uses the colors in her rug on her accent pieces, the small table and birdhouse. 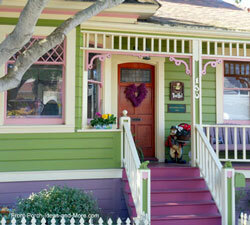 Using just a few colors and carrying them through on your porch can have dramatic effects. The birdhouse was purchased at Walmart for about $5 in the craft section. Lauren painted it with paint she already had; the jar was a thrift find. Filled with fresh flowers the jar creates a warm and inviting look. Lauren needed to update her cushion but couldn't find one she liked. Ingenious, she covered it with a leftover vinyl tablecloth. This is an inexpensive way to decorate and Lauren says "it's super easy to clean". These plants are just starting to bloom and in a short time will provide a wide array of spring color. Happy spring to you! and you'll have a charming pillow for your porch swing. Porch decorating with a garden hose wreath - so clever! and you have the cutest, freshest wreath for spring. 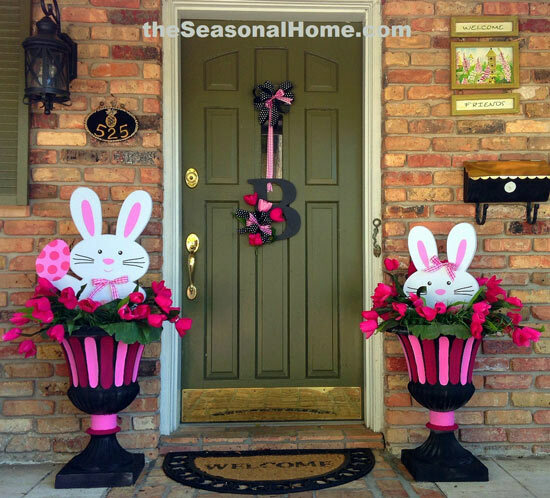 Crafty front door wreaths for springtime. Love tulips in the springtime? You will enjoy our DIY tulip porch. Pillow toppers and cheerful tulip banners to hang. Need to sell your home or just add appeal? 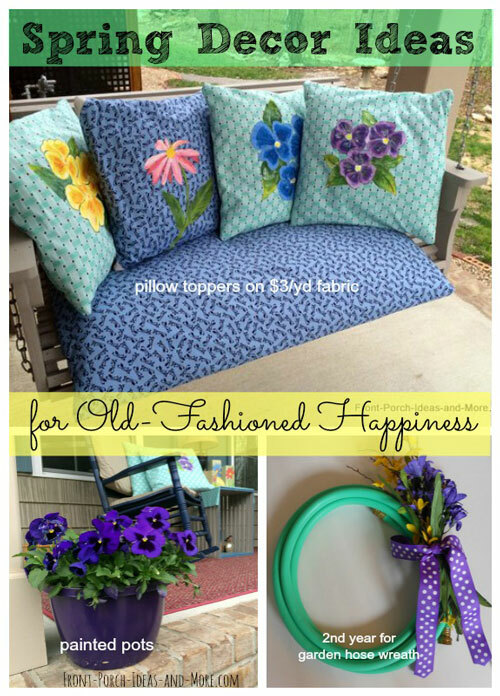 Rhonda shows us how she spruced up her porch by using a hot glue gun, a few colorful stems and some fun fabric. She even covered her cushions with fun fabric - but guess what? No-sewing involved - and inexpensive, too! 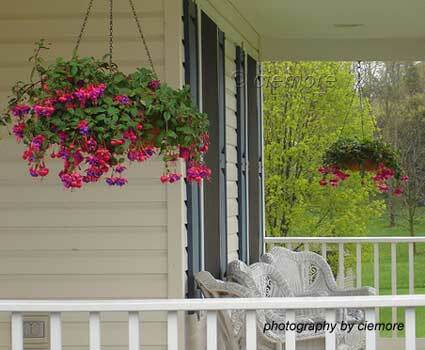 Hanging baskets can provide you with exceptional color on your porch and create amazing curb appeal. Placed strategically, they can also create a sense of privacy. Before you get too far into spring decorating ideas, don't forget to spruce up your porch. After the winter, it needs a good freshening. Clean around your windows, railings, and columns. Now is a good time to clean up the steps and walkways, rake leaves from landscaping beds beside your porch, and check to make sure down spouts are in good repair. It's a good time to wash the windows on your porch. A dear friend of mine gave me a professional window washer's recipe for a great window washing solution. Add 2 tablespoons of Dawn © dishwashing liquid to a gallon of warm water. Combine. Then rub on windows with a soft cotton cloth. Squeegee off and wipe window edges with a clean dry cloth. Works great. He says to be sure to use Dawn©. Do a little maintenance work. Take note of things that need to be fixed. 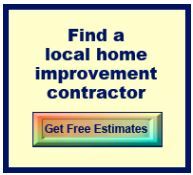 Repair loose balusters, caulk and paint columns, and secure any loose boards. Don't forget to take apart the light fixtures, clean the glass shades, and ensure the bulbs are working. Another great spring decorating idea is to think about upgrading your porch light fixtures. 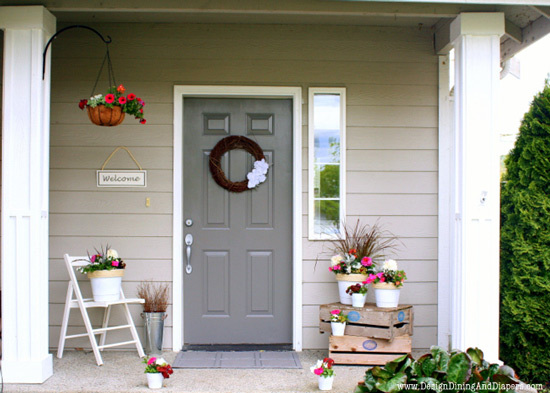 New fixtures, along with new door hardware can go a long way to spruce up your front porch. Want one for yourself or a friend? My sweet daughter-in-love picked this out for me for my birthday and I really love it. 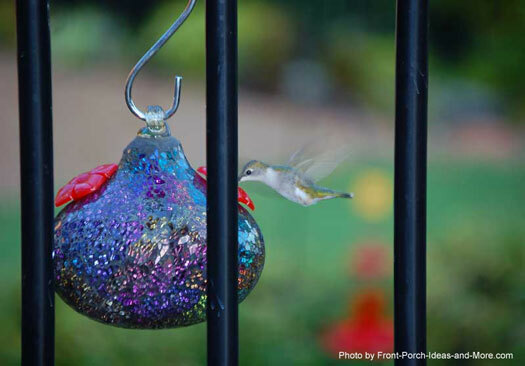 The hummingbirds love our sparkly feeder. We make our own food: 1 cup of sugar to 3 or 4 cups of water (either works).